Parkinson’s is a progressive neurological disorder characterised by tremors, stiffness, slowness of movement and balance problems. Other symptoms include mood changes, loss of sense of smell, pain and sleep disruption. Some of the side effects of the medication are as troubling as the condition itself. Parkinson’s disease is catalysed by a loss of nerve cells within parts of the brain called substantia nigra which leads to a reduction in dopamine. Dopamine is vital in regulating the bodies movement, and when reduced is responsible for many of Parkinson’s symptoms. The Cure Parkinson’s Trust (CPT) note that around 145,000 people in the UK are currently living with Parkinson’s disease, and predict that as many as 1 in 37 of us will receive a diagnosis of Parkinson’s within their lifetime. Many people who suffer from Parkinson’s begin to develop symptoms when they are 50 and over, however approximately 1 in 20 people first experience symptoms when they are under 40. Men are more likely to get Parkinson’s disease than women. The causes of nerve cell loss are at present unclear, however, experts believe it’s a combination of genetic and environmental factors. 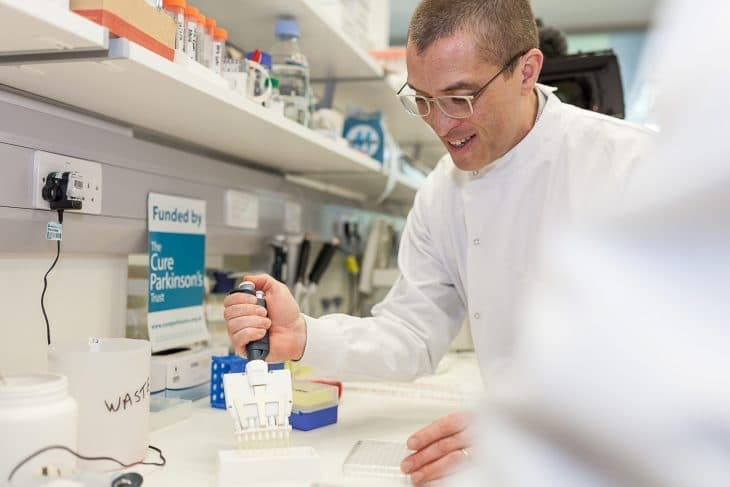 The CPT funds innovative research around the world which is dedicated to finding new treatments that can slow, stop or reverse Parkinson’s. For the past decade, the CPT has been a major global driving force behind several groundbreaking initiatives in the search for a cure for Parkinson’s. CPT explores and develops research that is highly focused and has led to many of the breakthroughs involving regenerative and conventional medicinal approaches which are directly influencing the current and future treatment of people living with Parkinson’s. This revolutionary work is achieved by working closely with a large number of scientist and clinicians from around the world who dedicate their time to making important discoveries within their laboratories. The CPT are also developing an exciting initiative, the Linked Clinical Trails programme, to help understand more about treatments being used in other disease areas that might have potential to be repurposed as an effective Parkinson’s treatment. This innovative approach now has over 30 drugs prioritised, with 17 already in or about to go into clinical trails. Donating your unwanted car with Giveacar can ensure the CPT can continue their pioneering work. Your old car can be recycled or auctioned and help fund important work into the research of Parkinson’s disease. Our service is free of charge, quick to collect and easy to use. Give your old and unwanted car a new lease of life by helping fund the CPT’s fantastic work.